Bistek…Bisteeeeeeek! | Hapa...Shot the Food! 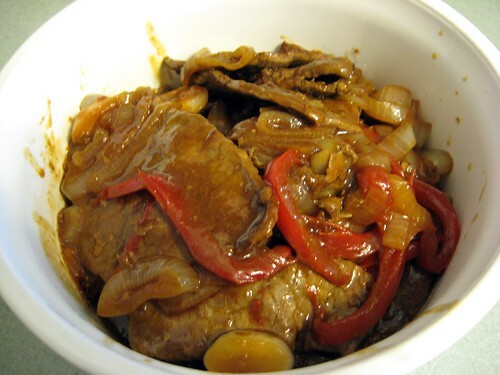 Bistek Tagalog is just simply… Filipino-style beef steak. 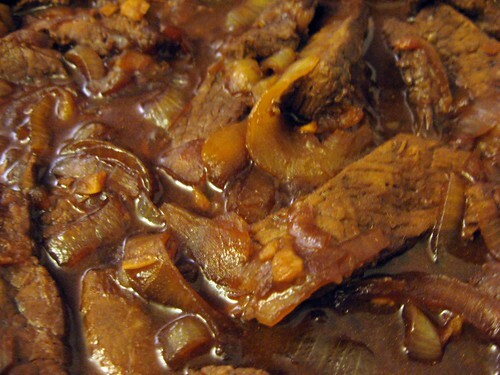 Like many other Filipino dishes, there are as many ways of making bistek as there are people making bistek (like my mom’s version pictured below), but it’s generally a simple dish: beef strips slowly cooked in soy sauce and calamansi juice (or lemon juice if you don’t have access to calamansi). 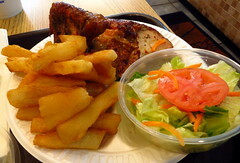 Mom tends to make it with red bell peppers as well as the standard ingredients. 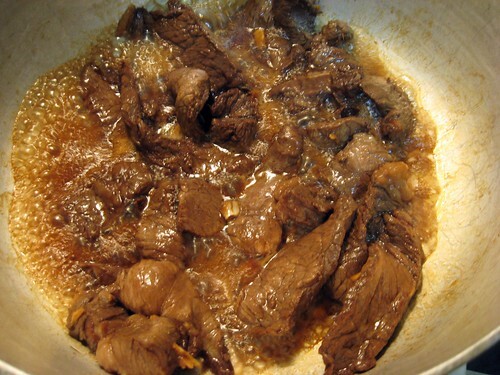 Instructions: Place the beef, kalamansi juice, soy sauce, and garlic in a large zip-top bag, or in a shallow dish, and marinate in the refrigerator for 30 mins. Heat the oil in a large saute pan or skillet over medium-high heat. Remove the meat from the marinade (reserve marinade, do not discard marinade) and sear the meat on all sides, 4-5 minutes total. 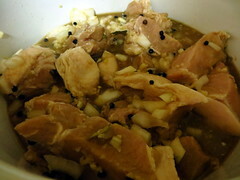 Remove meat from pan, place the meat in a bowl, and set aside. If the pan is dry, add a bit more oil. Add the onion rings to the pan and saute for 3 minutes. Pour the reserved marinade into the pan with the onions, being sure to deglaze and scrape the bottom of the pan with a wooden spoon or spatula. Bring the liquid to a boil, reduce heat to low and simmer for 10 minutes. Add the black pepper to the sauce and taste for seasoning. If the sauce is too salty, or too sour, add 1/2 cup of water if necessary. You can also add water if you just want to have more sauce. Add the meat back to the pan and cook for another 2 minutes. You can also thicken the sauce with cornstarch if desired. Serve with rice. 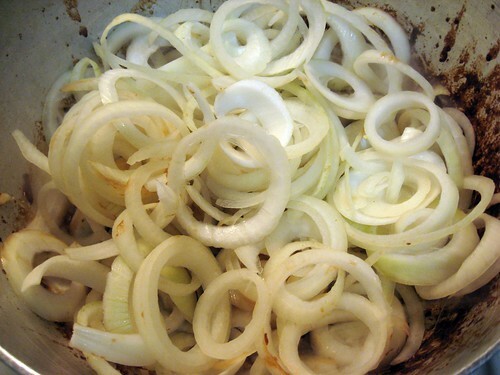 If you wish, you can actually cut the onion and place the beef in marinade the night before. 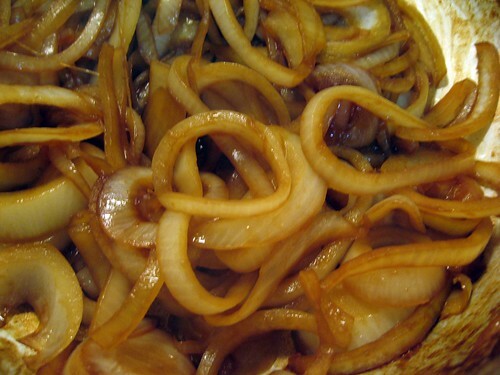 Refrigerate both the cut onions and the beef in marinade overnight. Don’t worry about the flavor being too strong: when I do it (with low sodium soy sauce) the flavor of the sauce isn’t overpowering. Purchase your beef already thinly cut. Most butchers and meat departments will do that for you upon request (at least from my experience). Here’s the steak, already marinated and cooking. I’ll soon take the beef out of the pan, as instructed. …and with the marinade fully cooked in. A shot of the finished product in a baking pan…ready to go to the potluck (My two baking pans have lids, so they’re useful for that purpose). Last: a closer shot of the finished product. Not to toot my own horn, but if I recall correctly, the bistek was very popular at the potluck. We definitely didn’t have any leftovers to take home. 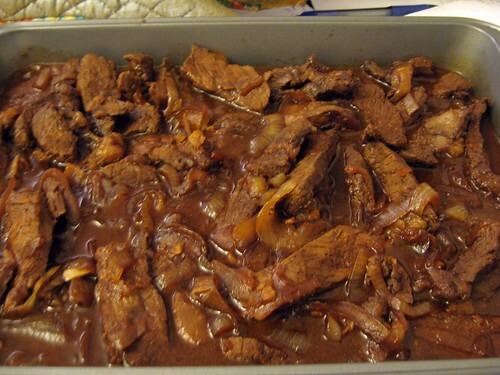 Posted on July 21, 2010, in Filipino, recipe, Uncategorized and tagged beef, bistek. Bookmark the permalink. 1 Comment. Pingback: Theme and Variation… « Librarian…Shot the Food!